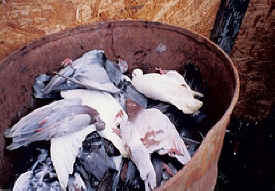 While the National Rifle Association continues its cruel mission of supporting even the most cowardly canned killing contests nationwide, and while the NRA continues to support and/or intimidate spineless and/or corrupt Pennsylvania lawmakers, we are slowly but steadily succeeding in cutting down PA's live pigeon shoots even without legislation. Information has come to us that the Pike Township Sportsman's Association has STOPPED PIGEON SHOOTS on its property. Pike was one of the major shoot locations, along with the Straustown Gun Club, which stopped pigeon shoots a couple years ago. Both of these clubs were documented and exposed by SHARK for the world to see their cruelty. As the late Gretchen Wyler would say: "cruelty can't stand the spotlight". That leaves the number of known pigeon shoot locations at three. The Erdman Sportsman's Club has only two shoots a year. The shoot on October 3 was the most poorly attended shoot we have ever seen, and they have pending criminal cruelty charges to deal with. Humane Police Officer Johnna Seeton has filed criminal cruelty charges based on SHARK's documentation. On top of that, the club is an excellent target for our Angel Air Force, as we showed during the last shoot. The Philadelphia Gun Club has been sued by an environmental organization called the Delaware River Keeper, and hasn't shot for some time. 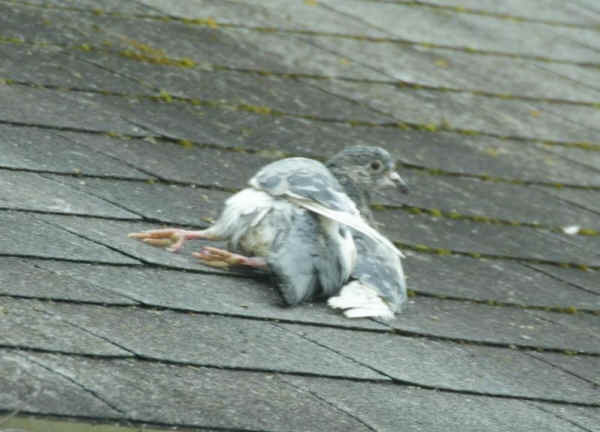 Shot pigeon dying on roof top at the now defunct Pike pigeon shoot. It will be a lot easier to pass a law to ban pigeon shoots when there aren't any more of them in the state. We're well on our way to getting there now, but we still have work ahead of us. My question is, will you be part of the victory, or just someone watching on the sidelines?